Student protest actions across South Africa’s twenty six universities has somewhat become a predictable event due to its sustained occurrence over the last decade, engendering a stereotypical attitude to protesting students and university education. Coupled with massification, the South African higher education milieu projects an inefficient tertiary systems raising questions of quality and worthiness of its graduates. 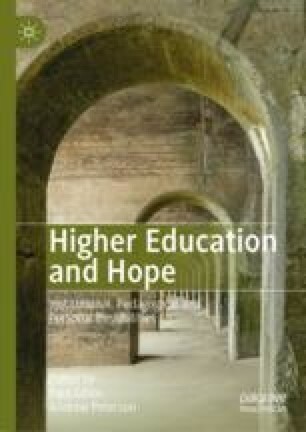 In this chapter I argue that, while systemically the current higher education milieu projects stereotypical conceptions about different student groupings leading to a normalising discourse, taking a humanistic perspective opens up a possibility discourse within which higher education studies have provided life changing opportunity for students. Drawing from an institutional case study I explore a humanistic perspective that prioritises understanding people’s subjectivity, and asks ‘, ‘what is it like to be this person?’ in making sense of the multiple forces and factors that students have to negotiate in accessing and sustaining their studying in a higher education institution. Using what Higgs (Dialogue and Universalism 2:13–22, 2011) describes as the ‘construction of plurality, pragmatism and judiciousness’ as an alternate discourse I take this approach to go beyond universal reasoning to individual reasoning that is textured, layered and discursive to illuminate hope and joy in students realised through their higher education studies. Butler-Adam, J. (2015). Is the Decline and Fall of South African Universities Looming? South African Journal of Science, 111(11/12), 2. Art. #a0132. http://dx.doi.org/10.17159/sajs.2015/a0132. Centre for Higher Education Trust (CHET). (2017). South African Higher Education Performance Data 2009–2015. Retrieved from https://chet.org.za/data/sahe-open-data#new_hepid.